Red-capped Mangabey (Cercocebus torquatus) is named for the distinctive red fur that looks like a “cap” on the primate’s head. This mangabey is classified as ‘vulnerable’ in the IUCN Red List of Threatened species, given that its global population has declined more than 30% over the past three generations. The species is believed range Cameroon, Equatorial Guinea, Gabon, and Nigeria. As early as 1982 however, the mangabey was already considered uncommon in Nigeria, and recent data indicates they may be even less common in Cameroon. The Mangabey population is in decline, and in some areas it is locally extinct or extremely rare. There are no global or local population estimates for the species. Major threats contributing to mangabey decline are loss of forest habitat and hunting for human consumption. 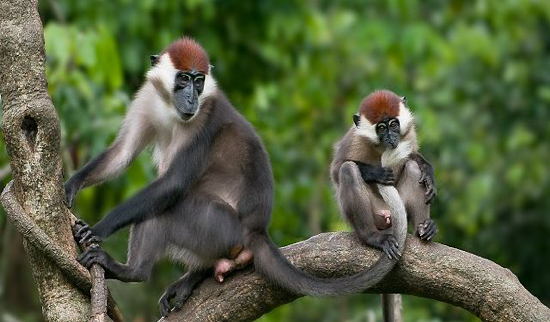 The Red-capped Mangabey is than other similar primates, which makes them ideal for hunting and consumption. Mangabey are also considered to be agricultural pests in many areas they inhabit, which threatens further their survival. In liaison with our local partner, the Tropical Research and Conservation Centre, we are woking with the Mbiabong community, along the Ikpa River Basin, to support conservation the Red-capped Mangabey and its habitat. Activities include community education and habitat preservation, mapping of core forest habitat for the Mangabey, providing alternative sources of livelihood for the forest users, and planting of local tree species for territory expansion.